If the country fascinates you, this miniature park could be a good alternative to discover the beauty of its territories. We speak of France in Miniature, the largest in Europe and one of the most visited amusement parks in the continent. With 5 hectares of surface, it hoards 117 monuments at 1:30 scale distributed in different zones according to its geographical position. The Eiffel Tower, the Notre Dame Cathedral, the Palace of Versailles and the castle of Josselin are the strong point of the park as it attracts thousands of tourists every year. In addition, Francia en Miniatura invites you to enjoy its particular attractions, such as the slide with six tracks and the panoramic tower. Where to find it? In the commune of Élancourt, department of Yvelines, about 40 minutes by car from Paris . The Europa Park in Torrejón de Ardoz is one of the largest green spaces in the Spanish capital. With 233 thousand square meters of surface, it hoards some of the most emblematic monuments of European cities. From the Eiffel Tower to the London Bridge through the Brandenburg Gate, the Bethlehem Tower and the Dutch windmills. What's more, this miniature park has lakes, canals and zip lines. It also boasts a cybernetic fountain, a multi-adventure area and an area dedicated to periodic exhibitions of wild animals. Impossible to get bored. In the city of The Hague , in the west of the Netherlands, is located Madurodam, the theme park with 1:25 scale miniatures dedicated to the most representative monuments and buildings in the Netherlands. The windmills of Kinderdijk , the Peace Palace, the Westerkerk church are just some of the architectural works you can find in this park, as well as the spectacular tulip fields. Divided into three areas, it has an area dedicated to historic centers with the most beautiful buildings in the Dutch cities, an area related to the 'world of water' and another area with multimedia facilities. With more than 5,500 miniature trees and 55,000 flowers, Madurodam exhibits the best of Holland. A monumental getaway in search of the most representative works of 80 cities in the European Union. This is the offer proposed by Mini-Europe, the theme park that boasts the miniatures dedicated to the most important European monuments. Located in the heart of Brussels, next to the Atomium , it has 350 models, all made to scale 25 times smaller than reality. From the imposing Big Ben to the Eiffel Tower, passing through the Palace of Venice, the Monastery of El Escorial, the Great Place of Brussels and the Acropolis of Athens. Walking the trails of the park is an original and entertaining way to travel to Europe and get to know it all at once. Games to discover the European Union, animations in miniatures, trains and boats. Also Mini-Europe offers a wide number of activities to do inside the park. Undoubtedly, admiring the Vesuvius Volcano in full eruption represents one of the best experiences you can do this spring. Nestled in the mountain landscapes of the commune of Melide, on the shores of Lake Ceresio, is Swissminiatur, an outdoor miniature park that exhibits the architectural and natural beauty of the Swiss territory. With an area of ​​14 thousand square meters, it has more than 120 1:25 scale models of the most famous monuments in the country . The traveler can touch with hand the castles of the Ticino, discover the typical houses of Bern and be impressed by the Wasserkirche, that is, the cathedral of Zurich. In addition, Swissminiatur has an authentic miniature railway network of 3,560 meters, which runs through the park crossing minipuentes and passing through the typical valleys of the Swiss territory. Nor will lovers of nature be disappointed because this immense green space boasts 15 thousand flowers and more than 1,500 trees. Italia in Miniatura represents the best option to discover in a short time the monumental jewels of the Alpine peninsula. 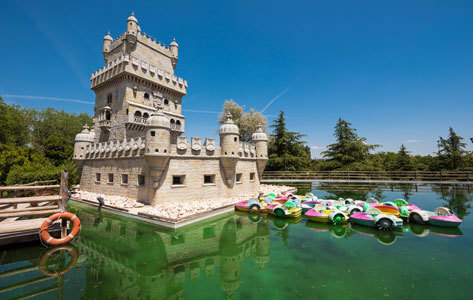 Located in the seaside resort of Rimini, this fascinating theme park has 273 miniatures that reproduce with rigor and fidelity the most emblematic monuments of the Italian regions. From the Basilica of St. Peter to the Church of Santa Maria del Fiore in Florence, passing through the Mole Antonellina in Turin, the Tower of Pisa and the Duomo in Milan. An original attraction? The scale reproduction of the city of Venice , five times smaller than reality. The park also has 5 thousand mini trees and 18 electric trains. And there is more: inside it is possible to entertain with water games, interactive shows and adventure routes in nature. If you are looking for a cheap way to go around the world in a single day, Minimundus is a good option. With 159 miniatures at scale 1:25 , this theme park has monuments from more than 40 different countries. The most expensive model? The Basilica of San Pedro for which they have spent more than 700,000 euros. In fact, the reproductions are taken care of in detail and made with prestigious materials such as travertine marble and volcanic rock. Located near the Austrian city of Klagenfurt, Minimundus treasures trains, boats and locomotives that travel on authentic rails. It also has a huge pavilion that proposes a large number of interactive activities to share as a family. From cinema in 4D to a career in Minicooper, through the area dedicated to selfie and cartoons. "A small space of History that will be England forever". So the website of the Bekonscot Model Village & Railway invites the traveler to discover the village of Bekonscot. More than a city of miniatures, it is a model town . And not just any one of the oldest scale reproduction in the world . Opened in 1929 in the town of Beaconsfield, southeast of Buckinghamshire, Bekonscot Model Village & Railway has more than 200 buildings grouped into six small villages. In addition, it has 6 thousand square meters of gardens, thousands of animals and a long railway line that runs from the very opening of the park. Visiting it is the best way to discover the England of the 30s, nothing less than a suggestive rural country with bridges, churches and windmills. Located in the town of Torrellas de Llobregat, Catalonia in Miniature invites you to discover about 150 scaled models 1:25 of the most representative architectural works of this Autonomous Community. From the Sagrada Familia and the Camp Nou stadium to the Castillo de La Suda de Tortosa, passing through the Santa María de Gerona Cathedral and the Bohí Valley. And of course, the modernist buildings of Gaudí. The park also has an adventure zone with circuits for the whole family. Also the Istanbul miniature park should be mentioned in this list as it is one of the largest in the world. We are talking about Miniaturk, a space of 60,000 square meters dedicated to the artistic and monumental heritage of the capital of Turkey. Now, here you will not only find models from Istanbul, but also monuments of Anatolia and some buildings erected in former territories of the Ottoman Empire. In total the miniatures are 135 and have been made following the same model, ie the scale 1:25. Churches, synagogues, obelisks, tombs. You just have to choose where to start the visit. You can not miss the 'Istanbul Crystal Museum', the first and the only glass museum in the world . It is a 3D space that exhibits the most beautiful monuments of the capital made of glass and illuminated with colored lights and laser technology. The 'Panorama Victory Museum' is instead a good option for history enthusiasts as it pays homage to the country's national memory.